The Bohr Model Calculator is a tool that can be used to compute the frequency of an electromagnetic wave which is emitted or absorbed at the transition of an electron in an atom. In the text below, we explain the principles of Bohr model definition of a hydrogen-like atom. Read on to investigate this theory further and learn about the relationship between frequency and energy. The electron is held in circular orbit around the nucleus by the Coulomb's force. Angular momentum of the orbiting electron is quantized. It means that the electron can only have specific energies on its orbital. The electron can orbit without losing energy due to radiating, but only on the certain discrete set of distances from the nucleus. Every orbital is associated with specific energy which is called an energy level. The electron can jump between different energy levels with absorbing or emitting the photon - the electromagnetic radiation. Its energy is determined by the difference between the initial and the final energy level. Check out our Photon Energy Calculator to find out how you can convert the frequency of the electromagnetic wave into energy. h is the Planck's constant which equals h = 6.6261 * 10^(-34) J ⋅ s.
When the final energy level is smaller than the initial energy level, the energy difference ΔE > 0 and thus electron will emit the electromagnetic wave. Otherwise, when ΔE < 0 electron needs to absorb the electromagnetic wave. Remember that energy levels of the electrons bounded to the atom are negative! Bohr model is a simplified theory which correctly describes atoms with only one electron orbiting around the nucleus (hydrogen-like atoms). The energy of the lowest orbit in the hydrogen atom is -13.6 eV and the second lowest energy is -3.4 eV. You can check it with our Hydrogen Energy Levels Calculator. The energy difference between those orbits equals ΔE = 10.2 and it corresponds to the frequency f = 2466.3 THz ≈ 2.5 * 10^(15) Hz which is astonishingly high! 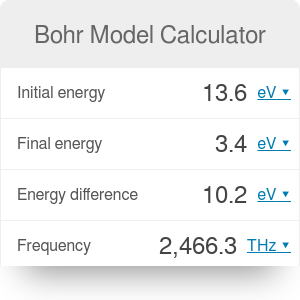 Bohr Model Calculator can be embedded on your website to enrich the content you wrote and make it easier for your visitors to understand your message.